I had some chocolate left over from some cookies I had dipped. There was probably about 6 oz. or so. It was a mixture of semi-sweet chocolate and milk chocolate (when I was finished with the cookies, I had simply combined all the chocolate into one container). I couldn't quite decide what I was going to do with this block of previously melted chocolate that was sitting in my refrigerator. 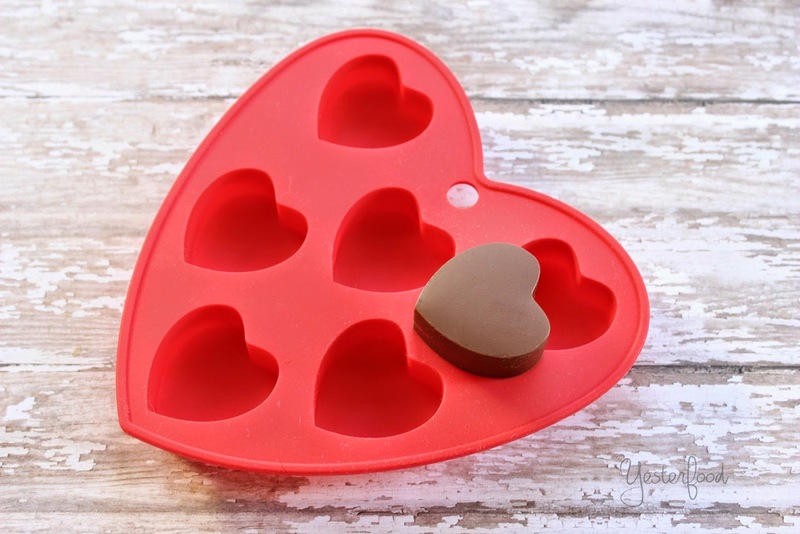 One day at a kitchen store, I saw a little red, heart shaped, silicone candy mold, and I knew that's what my leftover chocolate had been waiting for! This is one of the easiest things you'll do, and they turn out so nicely. My more artistic friends will think of ways to dress these up- drizzle them with something, pop them into a little cellophane bag tied with a bow, or nestle them into a cute little box. 1. Melt chocolate according to package directions. To make the chocolate a little smoother and easier to pour, you can add a bit of shortening or coconut oil (about a teaspoon per 6 oz. of chocolate). 2. Pour chocolate into molds. Do not overfill over the brim, or the chocolates will not come out quite as nicely and smoothly. Gently tap the mold on the counter two or three times to shake any air bubbles up to the surface. 3. 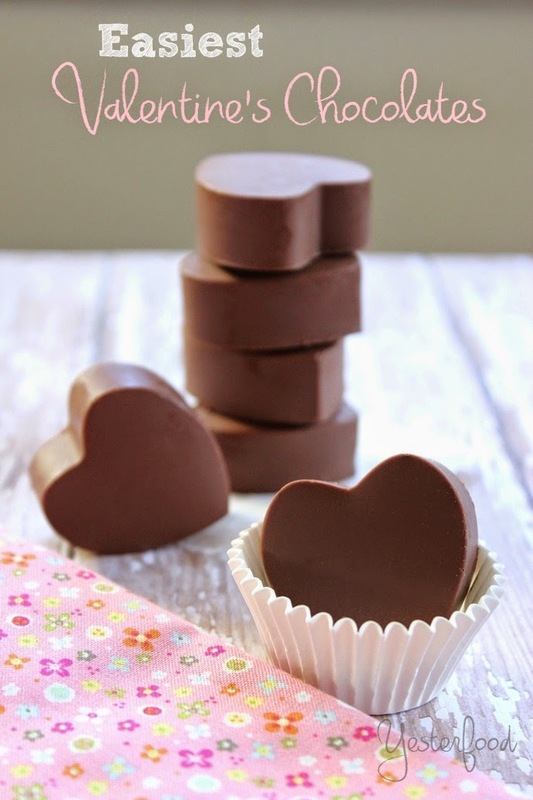 Refrigerate molds until chocolate is completely set and solid. 4. Pop chocolates out of molds, and you're done! Store tightly covered. If your house is warm, you may want to keep the chocolates refrigerated. Notes: I wasn't quite sure whether to oil the molds or not. Most sources I consulted said it was not necessary. I very lightly oiled the molds for the first batch (put a little oil on my finger and lightly went over the insides of the molds). For the second batch, I washed and dried the molds and did not oil them at all. I couldn't tell any difference in how the chocolates came out. Easiest Valentine's Chocolates may have been taken to some of these fun parties, including Metamorphosis Monday. These Chocolate Hearts are adorable. What could be better than chocolate and a heart for Valentine's Day. They also sound so easy to do. I am going to the store this morning. I am going to check out my Walmart and Kroger for these cute molds. Thanks so much for sharing! Great way to use up leftover chocolate - I wouldn't know what that is because there is never any leftover Chocolate around here !!! Hi Joy! These chocolate are beautiful. I can't believe how easy they are to make. Thanks for sharing! These chocolates look so lovely for Valentine's day. 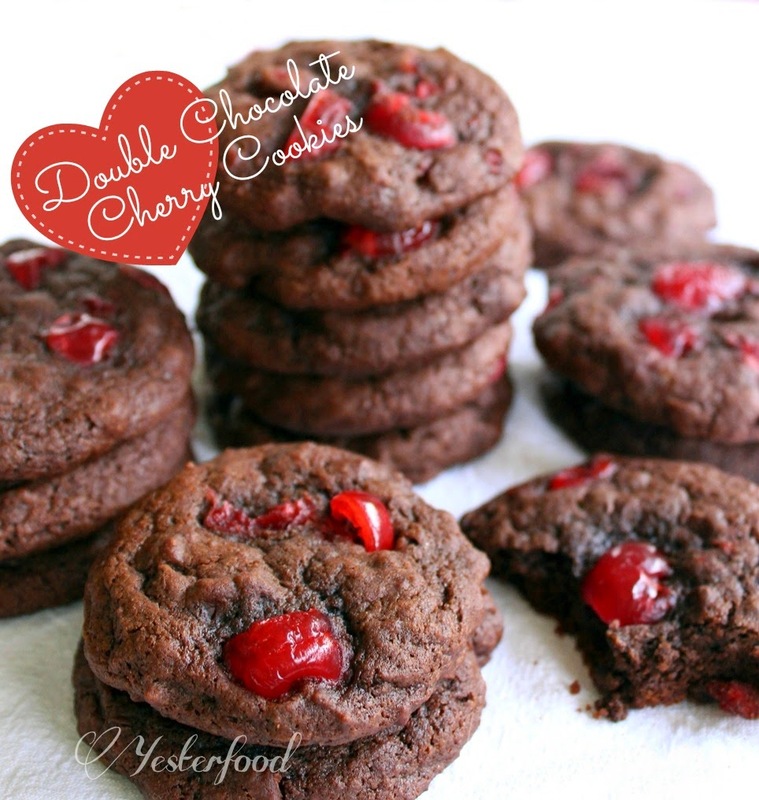 Homemade candy is the best :) I'm off to check out your recipe for the Double Chocolate Cherry cookies. They sound scrumptious! I bought a silcone heart mold from Good Will and never knew how to use it. Thanks for sharing this recipe, can't wait to try it! They are so cute and who doesn't like chocolate?! Oh my gosh! Those came out so cute and perfect!!! I just made chocolates the exact same way and was amazed at how smooth and perfect they came out! I actually put a slit in my mold so that I could rest a lollipop stick in the mold! :-) Saying hello from Friday favorites! Wow those look so fancy! Beautiful! So simple and so (truly!) sweet! I'm intimidated by most candy recipes but this one I can do! Those molds are everywhere now, but even if I miss getting a heart design there's always other shapes for other holidays. Thanks for a cute idea! Ah these are lovely, very cute and easy to do. It's a good way to use up left over chocolate. How adorable! I've haven't used a silicon mold yet, wondering how they worked. As I'm writing this, I'm thinking of the leftover Nutella I have that could be used as a center layer. Oh yum! I think a silicon mold is now on my list of fun stuff to buy this weekend. Thanks for sharing! I have one of these silicon molds that I haven't used yet, but your chocolates look so nice, you have inspired me to dig it out of my cabinet, and get working. What could be better for Valentine's Day!! I would love if you would drop by and link this up to Celebrate It! It's all about sharing how we celebrate the big and small moments of our everyday lives. I love how simply this came together once you found the right mold! I'll be on the lookout now for a similar one. Thanks for sharing at Weekend Bites! Such perfect little hearts! Gifting in mini cupcake liners, just the way you have them, is a lovely idea, simple and "heart" felt. ;) I think these little chocolates would be awesome used to decorate a Valentine's cake or cupcakes too. Love these, super cute! :) Visiting from The Pin Junkie! That's awesome. I love the perfectly shaped hearts. Thanks for sharing with Scraptastic Saturdays. Your chocolate looks so creamy!! I bet Yummy too! Thanks for sharing on My 2 Favorite Things on Thursday!! I have Pinned this too!! Don't forget to come back next week and share some more!! I love having you! Oh my these are so cute!! Found your linke on Balmtomysoul link up party. Just pinned. My 11yr old just made chocolates like this. She used a mini heart mold that I picked up at Target a few years back. Super easy and cute too! Thanks for sharing on Merry Monday. You made this look super easy! So easy - and my kiddos would love them! :) I need to find a silicone heart mold! These look so pretty! I need to invest in some molds. I just made my first candies not too long ago. 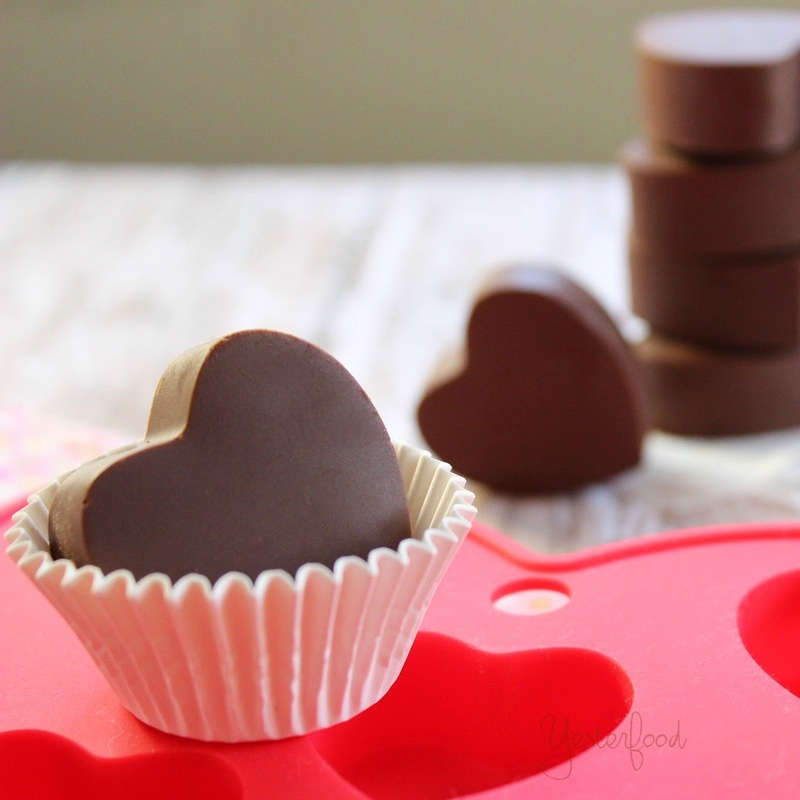 I need to find a mold like this - I have a mini heart muffin pan but no candy molds. Thanks for the recipe - and idea. Oh my gosh! I have those silicone molds....but how did you make them look so perfect?? How cute and clever! I think I need to get some of these silicone molds as I keep seeing recipes for all kinds of cute things. You absolutely can't go wrong with simple chocolates for Valentines....or any time for that matter! Oh wow! These are so simple! I bet you could even tweak them a bit by adding some sprinkles or a swirl of another type of chocolate. Thanks for sharing! What a great idea! These are so cute and so easy. Love it! Thank you so much for attending week 19 of #PureBlogLove and linking your fantastic blog post, I can't wait to see what you have in store for our next party, Thursday 8 PM EST- Sundays at midnight. Your post has been added to the #PureBlogLove Pinterest board for all to see :) Have a great day! Great idea! I wish I had thought of it. This is definitely the way to go! The charm is in the shape :) Thanks for sharing with us on the Art of Home-Making Mondays! Seriously, Thanks to these, I'm wanting chocolate so bad right now, I'm about to lick the bottom of the cookie jar. Yum. These chocolates are just beautiful. Hope to see you this week at Funtastic Friday. Love how simple this is! Anyone can make these (even if they can't bake) Can't wait to feature these on Saturday Night Fever! Yum. Had to fb share. Looking forward to making some of these! Those silicone molds are wonderful. Sure do look pretty! Thanks for sharing with SYC. Wow, these look amazing and perfect! Thank you for linking up to the Bloggers Brags Pinterest Party. I have pinned your post to the Bloggers Brags Pinterest Board. 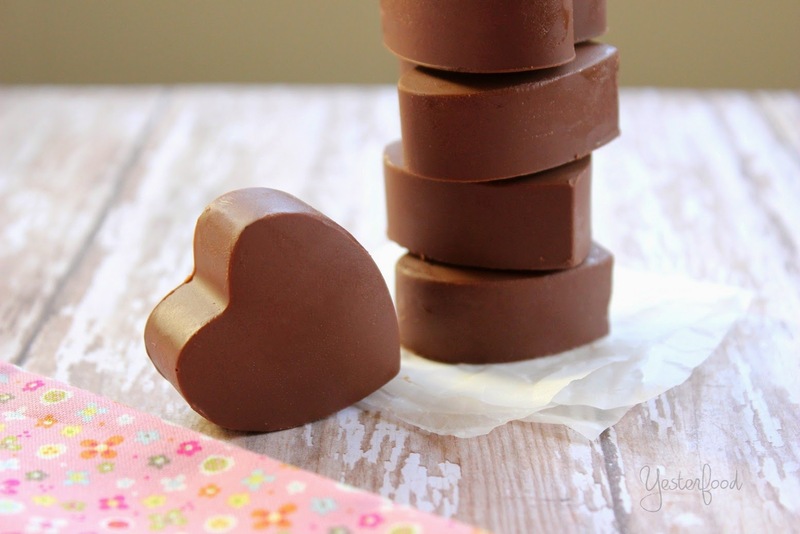 Beautiful chocolate, thanks for sharing with Hearth and soul blog hop, pinning and tweeting. Hey Joy, love your chocolates! I’m featuring this tonight on Worthwhile Wednesdays. These little chocolates are just awesome, I love the little container. Thanks so much for sharing your talent with Full Plate Thursday.